For a limited time, you can pick up special item packages that contain*Maple Stamps! These Maple Stamps can be used to purchase new items including mounts, outfits, chairs, and more! You can see all the rewards rates for Premium Surprise Style Boxes*here, and the rewards rates for Royal Style Coupons*here. Open the Surprise Pet Box (available exclusively in Reboot world) to obtain one random pet! It contains both 90-day and permanent pets. Take home a permanent*Jr. Hilla,*Jr. Orchid, Jr. Von Leon, Pink Dragon,*Ice Dragon,*Red Dragon,*Lil Tutu,*Lil Nene, or*Lil Lingling! Get rewards! The Philosopher's Book is a special event item that will give you two random in-game items when you open it. You will receive two random items, one from two separate reward pools. *Each Philosopher's Book can only be used once. Breath of Divinity: Ring. Provides the skill "Dawn Shield" which blocks enemy attacks and gives the player a rechargeable shield. Req. Lv: 150. Trade disabled when equipped. Unique Item. STR/DEX/INT/LUK: +15. MaxHP/MaxMP: +200. Weapon ATT/Magic ATT: +25. Accuracy: +150. Avoidability: +150. Speed: +18. Jump: +10. Number of upgrades available: 1. Can be enhanced up to 25 Star. Note: The Philosopher's Book can only be purchased with NX Prepaid and Maple Points. You have until 11:59 PM PST on February 24 (2:59 AM EST / 8:59 AM CET / 6:59 PM AEDT on February 25) to purchase these items. Make sure to move them from your cash inventory to your item inventory and use them soon! 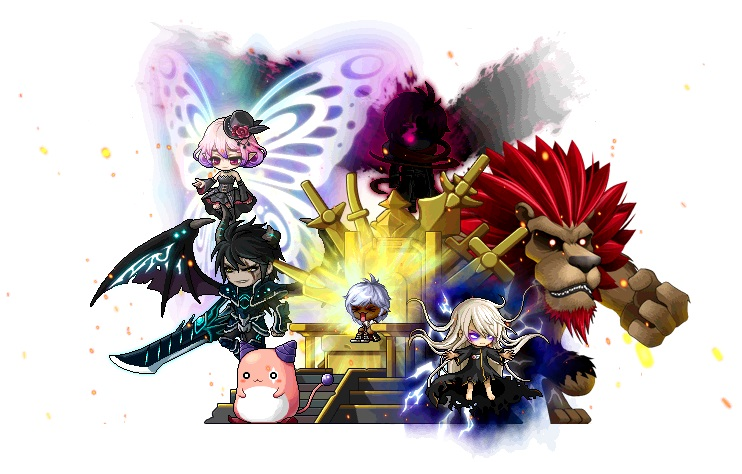 Left to Right: Shinsoo's Light, Shinsoo's Descent, Fairy Tale Ballad, Shinsoo's Steps (M), Imperial Honor; Empress's Light, Googly Face Accessory, Audience with the Empress (F), Empress's Steps (F), Fairy in a Gilded Cage; Lucid Fedora, Sweet Shipmate Uniform (F), Sweet Shipmate Boaters (F), Dreamland Thief Effect Ring; Cloud Crown, Round Pucker Face, Sweet Shipmate Uniform (M), Sweet Shipmate Boaters (M). Left to Right: Suit Heart Hair Clip, Red Hearted Eye Patch, Suit Heart Oufit (F), Master of Hearts; Devil Wolf Seduction, Suit Heart Outfit (M), Sweet Jelly Paw; Sweet Wiggly Ears, Sweet Chocolate Suspenders (M), Sweet Sugar Shoes (M), Sweet Sugar Powder; Sweet Lace Ears, Sweet Chocolate Dress (F), Sweet Sugar Shoes (F). Left to Right: Pink Bear Winter Hoodie, Pink Bear Winter Padded Coat, Pink Bear Winter Boots, Snowy Cherry Blossom Label Ring, Frosty Cherry Blossom Chat Ring; Nova Enchanter Hat, Nova Enchanter Clothes, Nova Enchanter Winged Cape, Nova Enchanter Staff; Tennis Cap, Tennis Uniform (Male), Tennis Racket; Seafoam Ribbon, Seafoam Coral Coordinates (M), Bitten Donut Ring. Check out the Female Hairstyles available now: Sweetie Pie Hair (NEW! ), Forest Wind Hair (NEW! ), Irena Hair, Aerial Hair, Chic Tail Hair, Sylph Hair. You can see the all the rewards rates for Royal Style Coupons here. Bring these powerful Lil' Lucid pets along for your journeys in Reboot World! Give your new Lil' Lucid pets a little sparkle with this permanent pet equip! Step into a World of Pink with these colorful permanent outfit pacakges!